This is the third review of the Polk Audio RT series loudspeakers to appear on TNT-Audio. The first two introduced Polk Audio and the RT series, then examined two price extremes of the this series: the RT15i bookshelf speakers, priced at $119.95 each, and the RT2000i, floorstanding speakers with incorporated, powered subwoofers priced at $2,000 per pair. 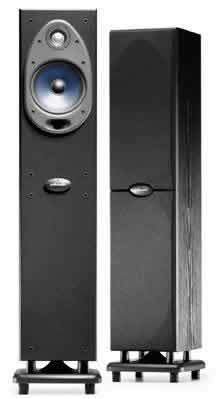 The RT600i speakers lie in between at $379.95 each; they are also the smallest of the floorstanding RT line. The Polk RT600i is a moderately sized, floorstanding loudspeaker that incorporates Polk's latest audio technology. It is tall, slender, and measures 97.47cm high, 20.32cm wide, and 26.67cm deep (38-3/8" x 8" x 10-1/2"). As a result, the RT600i occupies very little floorspace and is quite easy to accommodate in most rooms. 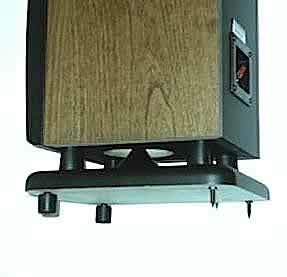 A small speaker stand is incorporated into the design providing better stability for the speaker, giving greater flexibility to the user as to the use of rubber or spike feet, and providing a tuned outlet for the bottom-firing port. Four adjustable rubber feet are included with the RT600i to allow stability on wood or tile floors; removing the rubber reveals carpet spikes hidden within. The RT600i is a two-way loudspeaker that uses Polk's proprietary drivers, a 2.54cm (1 inch), Dynamic Balance®, Tri-laminate dome tweeter and a 16.51cm (6.5 inch), Dynamic Balance® driver. In addition, the RT600i drivers are shielded, allowing placement of the speakers anywhere, even next to a television set. Both drivers and the Polk Acoustic Resonance Control (ARC) port are located on an ovoid-shaped, raised bezel called the Anti-difraction Bezel. The bezel was designed to reduce sound diffraction caused by the speaker cover and enhance three-dimensional sound imaging. The purpose of the ARC port is to reduce internal cabinet resonance and improve clarity of midrange sound. The RT600i is a bass-reflex speaker that utilizes a downward-firing port. However, this port, called a 'Power Port', is a design unique to Polk. It incorporates a cone within the mouth of the flared port that is designed to produce laminar airflow through the port thereby reducing port noise and improving bass efficiency. The Polk speaker has a rated frequency response of 45Hz to 25KHz at -3dB and a rated efficiency of 90dB at 1 watt, at one meter. The high-quality crossover network has a 12dB per octave rolloff crossed over at 2500Hz. A single pair of gold-plated, 5-way binding posts are located near the bottom of the cabinet on the backside. There are no accommodations for bi-wiring on the RT600i; the next speaker in the RT line, the RT800i, is designed for bi-wiring. As expected from Polk, this is a very attractive speaker. The tall, slender shape is complemented by the slightly wider speaker stand incorporated into the base. There are three wood-veneer finishes available on the cabinet: black oak, maple, or cherry. The wood finish, which is visible on the top and sides of the the cabinet, is smooth and very deep in appearance. The front of the cabinet is black plastic with rounded edges. The front of the cabinet is covered by two easily removeable, cloth grills; the top grill exposes the drivers; and, the bottom exposes only the plain, black, front of the cabinet. In between the two grills is the tastefully excuted, oval-shaped, Polk logo. Polk RT600i, speaker bottom showing the Power Port, binding posts, two adjustable rubber feet, and two carpet spikes. The Polk RT600i loudspeakers have a tonally-balanced, clean, neutral sound. Unlike many speakers that are partially marketed for home theater, they lack the shrill and sibilant high frequencies so commonly found in that market. In fact, the mids and highs are so well balanced, that vocals and acoustical instruments sound surprisingly clean and natural. With stringed instruments, the plucking of the strings, the movement of the artist's fingers, even the resonance of the instrument is clearly reproduced. Male vocals lack any congestive sound; female vocals sound clear without a hint of the nasal quality that haunts so many competitively-priced speakers. Bass, while strong and surprisingly deep, is not boomy and overpowering, but instead is reasonably quick and very clean. These speakers are very good at reproducing music (They also work quite well with movies...). The output of the RT600i speakers is very neutral, providing clean and natural sound across its audible frequency range. The rated frequency response of 45Hz to 25KHz seems accurate; the Polk accurately reproduces sounds well below 50Hz. This is quite remarkable for a loudspeaker in this price range with a single, 16.5cm woofer. The RT600i speakers are very accurate and detailed, allowing the listener to hear everything on the recording. In particular, when volume is kept low, musical details that might escape lesser speakers remain audible and intelligible. Dynamic range of the RT600i is also excellent. When music with great dynamic range is played, the softest passages remain clean and clearly audible while the loudest passages are delivered with force and tangible presence. Combining the RT600i with a mere 35 watts per channel results in a system with the ability to play softly and sweetly, or to rock out; this is a speaker that will impress music lovers, although teenagers might miss the hollow booming bass common to many competitively-priced, popular speakers. While many people believe that floorstanding speakers do not allow good soundstaging, the RT600i gives proof that this is not necessarily true. The soundstage of this speaker is excellent; at its best, it is wide and deep. There is sufficient air between instruments to accurately place them within the soundstage, not only left to right, but front to back as well. This effect is aided by the wonderfully detailed presentation. While some credit may go to Polk's proprietary ARC port, which is designed to clean up midrange sound, the fact that this floorstander has only two, closely spaced drivers on a raised bezel seems likely to be a large contributor to the spacious soundstage. The driver spacing and location is similar to that of a small monitor speaker placed on a stand; small monitors are often lauded for their soundstaging cabability. However, compared to a small monitor on a tall stand, the RT600i has greater internal volume and much higher efficiency than most small monitors allowing deeper bass with less power while still maintaining the large soundstage. Proper speaker placement was easy to achieve; the Polk is relatively easy to place and still achieve excellent results. With a little experimentation it was found that a little toe-in assists the imaging, and keeping the speakers at least 50cm away from the wall results in excellent tonal balance. Unlike some manufacturers, Polk does not seem to overestimate the sensitivity of this speaker. When the pair of RT600i loudspeakers was connected to a pair of low-powered amplifiers (4 watts per channel), they handled the change beautifully. The highs sounded just as clean and clear. The mid-range sounded even better with the small amps. However, the real surprise was that the bass remained deep, strong, and potent. It did not have quite the punch of the 35 watt amplifier, but all the low-end detail remained. 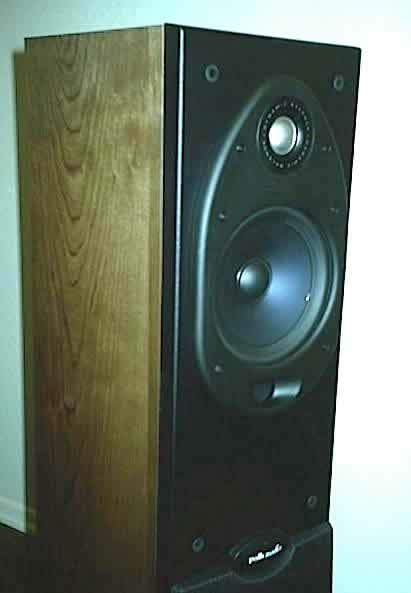 Polk recommends a power range for this speaker of 20 to 150 watts, but 4 (high quality) watts worked suprisingly well. As would be expected of a Polk product, the RT600i is flawlessly finished. The test units have the cherry finish, which is smooth, lustrous, and would fit well with finer furnishings. This speaker has a very high WAF (wife acceptance factor) due to its modest size, simple, attractive appearance, and fine finish. While the RT600i speaker is generally quite forgiving of placement, there is one place it does not work well - this loudspeaker should never be placed against a wall or in a corner. When placed too close to wall or corner the strong, deep bass becomes boomy and overpowering, distracting the listener from the music. Moving the speaker only 25cm away from the wall was enough to prevent most boominess; 50cm was even better. In all fairness, most speakers do not sound their best when placed too close to a wall, but the RT600i, with its bottom-firing port, seems a bit more critical than many other speakers in this regard. RT600i, cherry finish, drivers in bezel, with ARC port on lower edge of bezel. The driver bezel is a bit odd in appearance. At first glance, some guest listeners thought it homely, and that it should always be covered by the removable grill (an opinion not shared by the reviewer). The RT600i sounded very good with the grill in place, but excellent with the grill removed. The aesthetic appearance of the driver bezel is a matter of opinion and is a minor point, as it can remain covered for those who would rather look at their speaker than listen to it. Polk has created a loudspeaker that is at once clean and natural sounding, detailed without being overbearing, and very user-friendly. Speaker positioning is always important, but this speaker is very forgiving of placement, provided it isn't placed against a wall. Not only is the RT600i an excellent sounding speaker, it is practical choice. It is practical not only because it is moderately-priced, it is also practical because it is modestly-sized. With less than one square foot of base area per speaker, they are easy to place in almost any listening area. The RT600i loudspeakers fill a room with rich sound that belies their low price. While Polk has been aiming much of their effort at the home theater market, it is gratifying to know that they have not forsaken their audiophile roots, especially with speakers as affordable as the RT600i. A pair of RT600i loudspeakers would serve equally well as main speakers in a home theater system, or as only speakers in a hi-fi stereo. This is not a budget speaker at a moderate price. This is an excellent and satisfying loudspeaker, both in terms of sound quality and aesthetic appeal, and it is available for a very modest price. We can only hope that Polk's ploy to produce good sound quality will be rewarded by consumers. This is one test component that surely will be missed after it is returned to the manufacturer! Many thanks to Paul DiComo of Polk Audio for providing background information and the units used in this review.